Oh, my Gaudi…Barcelona was beautiful in the brief half a day that we were there! Let me tell you, by this point of our 12-day backpacking Eurotrip we were pooped. While I was excited to see all the things and places I wanted to see, I was also exhausted and looking forward to returning home and sleeping in my bed. I can’t even tell you how many times I fantasized about my bed…Anyway, when we got to Barcelona from Italy it ended up being quite a rainy day, so it gave us a nice break from traversing all over the city, and an excuse to focus more on sitting down and eating, thank goodness. Also it made Visiting Barcelona in one day significantly easier. We left Rome at 9:05 am and arrived into Country #6 on our Eurotrip, Barcelona, at 11:05. The flight was really interesting because it was the first flight where we were flying over water, and the Mediterranean Sea is not too shabby of a site to fly over. Fun fact: While Barcelona is in Spain do not assume everyone speaks Spanish because the official language used is Catalan and the people are quite proud of it. With that in mind, I was still able to utilize my Spanish because the languages are quite close, and MOST people knew Spanish as well. However, it’s always best to ask them first rather than just starting in Spanish. I found that English was not nearly as prevalent in Barcelona as it was other cities we had visited, but hey we did only speak with like 10 locals so probably not an accurate judgment. The airport, like always, was a distance from the city center and we used public transportation since it was cheapest. We opted to buy a bundle of 10 T10+ tickets loaded onto a card for a total of €9.95. The great aspect of this card is that it can be shared among people, so the three of used this one card and split the cost. It was perfect because 6 of the rides got us to and from the airport, and we had a remaining 4 rides throughout the city. Also, one ride is good for any mode of transportation over a period of an hour, so you change between buses. We hopped onto the R2 Nord train that took us from the airport to Barcelona Sants station. While on the train we passed through beautiful Spanish scenery. Look at these mountains! We actually only ended up having one day in Barcelona with an early flight in the morning, so we opted to crash in the airport that night. P.S. the airport is super cold and drafty so dress warmly for Barcelona’s airport if you plan to sleep there overnight. Given that we were visiting Barcelona in just one day we were trying to cram as much as we could in one day. One of the major sites I wanted to see in Barcelona was Park Guell. Upon departing the train station you could tell it was quite close to raining, so we decided to go their first and try to beat the rain. Park Guell is actually quite far from Barcelona Sants, so we took a bus from Barcelona Sants and had to make a transfer from one bus to another to get to our destination. We used buses 32 and 116 and it took us about 45 minutes to get there. Once we got there we purchased tickets to enter the park. There is a free option to enter the Park, but access to the Monumental Zone is not include. The ticket for the Monumental Zone is definitely worth the price so you can see the beautifully tiled section. A certain allotted number of tickets are available per day, so it can be beneficial to buy in advance online, however, we had no problem buying at the counter. Park Guell was designed by Gaudi and is stunning. There are tiled sculptures, fountains, and walls everywhere. Our visit to the Basilica did not disappoint. While we didn’t go inside, solely due to the massive queue for tickets, the outside was the most impressive I have seen yet. The interesting thing is this Basilica has YET to be completed, and it began construction in 1882. Construction is projected to be finished in 2026. Mind blowing. Just off beyond the Sagrada Familia, was a Christmas Market. Strolling through it I came across a cheese stall where I sampled Catalonian Buffalo Cheese. Now, I LOVE cheese and this cheese was just divine. However, my pocket could not afford the €30 price tag for a measly portion of cheese, so I had to turn it down, sadly. After the Basilica we decided to stroll over to Catalonia Square. On our way, we came across Casa Batilo. Probably one of the more interesting sites of Barcelona. The architecture was so fascinating. You can purchase a ticket and explore the inside of the house but by the time we got there it was already closed. As we progressed to the Square, the sun continued to fade away, while the night lights slowly dimmed on. We passed a few more interesting buildings on our way to the Square. My favorite thing about nights; the fountains gain hues of blues, pinks, and greens. We stood there for a bit enjoying the lights of the fountains in the square until the rain decided it was back to torment us, so we rushed off in search for coverage. After we had finished viewing Park Guell, it started raining, so we quickly popped into a restaurant and settled in for some Paella. Both Eli and I ordered Paella whilst James ordered a Jamon and cheese sandwich. The Paella was absolutely delicious, and at a quite affordable price. 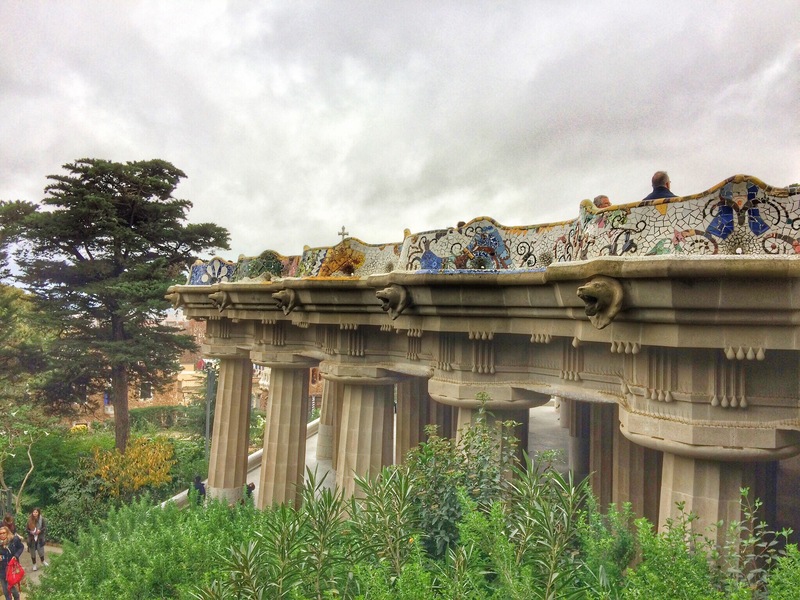 What to do in Barcelona to hide out from the rain? Eat obviously. So we were off to En Diagnol Bar and ordered a few tapas to enjoy. We ordered patatas bravas and anchovies. Let me tell you, I was fully expecting to dislike the anchovies and was 100% pleasantly surprised. At first, there was a bit of an aftertaste, but after eating the second one it was just tasty. The Patatas Bravas were essentially potato fries with a ketchup-based sauce on it. The gentleman serving us at En Diagnol Bar was very friendly and though he didn’t speak Spanish he did his best to assist us with our order. As the night progressed, the rain only got worse. Our options were to get soaked in the rain roaming around the city or head back to the airport. Circa 9 pm we decided enough rain was enough and we would just cut our losses and head back to the airport. Though I didn’t get to see everything I wanted to, it’s only an excuse to return one day, right? We made our way back to Barcelona Sants and used our remaining T10 tickets to hop on the R2 train to the airport. Barcelona Airport is very drafty, and in the middle of December, that calls for a very cold night. This was definitely one of the hardest nights of sleep I had, considering I basically got none because I was shivering all night. The next morning we were off to country #7 on our euro trip, Munich, Germany! In Barcelona we walked a mere 11.3 miles! T10 tickets – €6.67 for James and I. €10 total, split 3 ways. Barcelona is such an amazing city, I hope you get to go back for more than a day next time! 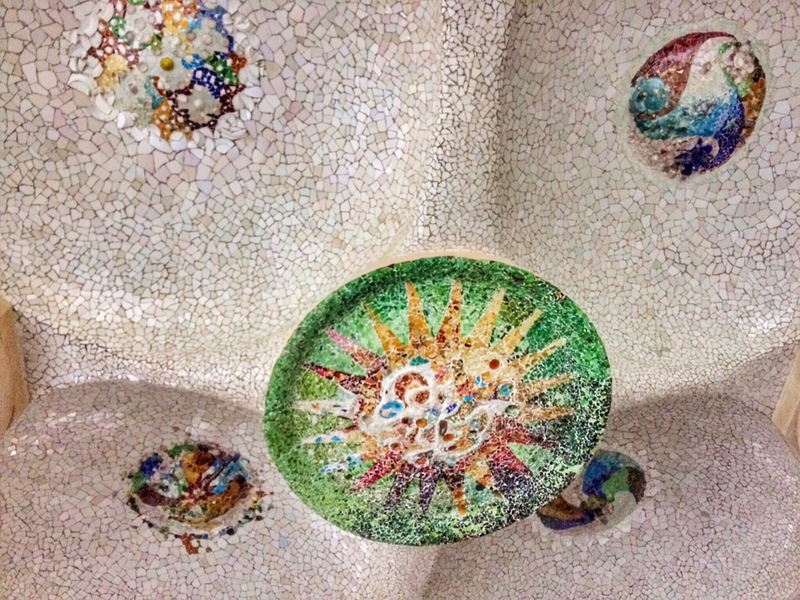 Your photos of Park Guell look absolutely beautiful! Thank you!! I hope to return one day. I went to Barcelona couple of months ago and I have been there numerous times too. It is simply a city you can never get bored with, I love it!!! I definitely ant to visit again! I’m amazed that you managed to do all that in just one day! The pictures were lovely. Wow! Thank you for sharing your journey especially the costs of the trip. The Basilica Sagrada Familia is appears so ornate with mind boggling details. It is a drastic departure from what detailed craftsmanship is seen in Germany’s Cologne Cathedral, but it is like comparing apples and oranges. Again thank you for sharing your journey to the masses. Thank you so much, the Basilica is so ornate its crazy! Your post is amazing, not just because of your absolutely fabulous pictures, but also because of your narration and the wonderful tips and break up of costs. A complete post! The pictures of the Basilica are simply mind blowing. Such beautiful details! Love it! I don’t doubt you get along fine with English – like I said I only spoke to a handful of locals. We flew into BCN but the bus ride took closer to an hour, maybe there was a lot of traffic that trip haha. I definitely would like to return and visit in better weather and for longer time!